The animal with the most sophisticated vision is thought to be the mantis shrimp. Humans have only three kinds of light receptors while Mantis shrimp have ten allowing them to see not only visible light but infrared and ultraviolet light as well. They are the only invertebrates that visually recognizes members of its own species. While humans see three pigments (red, yellow and green), mantis shrimp see up to sixteen. 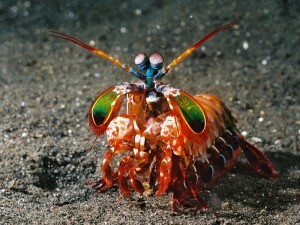 Mantis shrimp also have polarized filters and some can even produce signals detectable only with a polarized filter. Mantis shrimp are also able to see in stereo with each eye individually, which means that if they lose one eye, they can still see just as well. Last, but not least, they have one of the fastest movements in the animal kingdom, only the frogfish and trap jaw ant are faster. Please login or register for COLLECTION OF TOUCHSTONES AUDIO LESSONS or TOUCHSTONES - Mantis Shrimp to view this content.